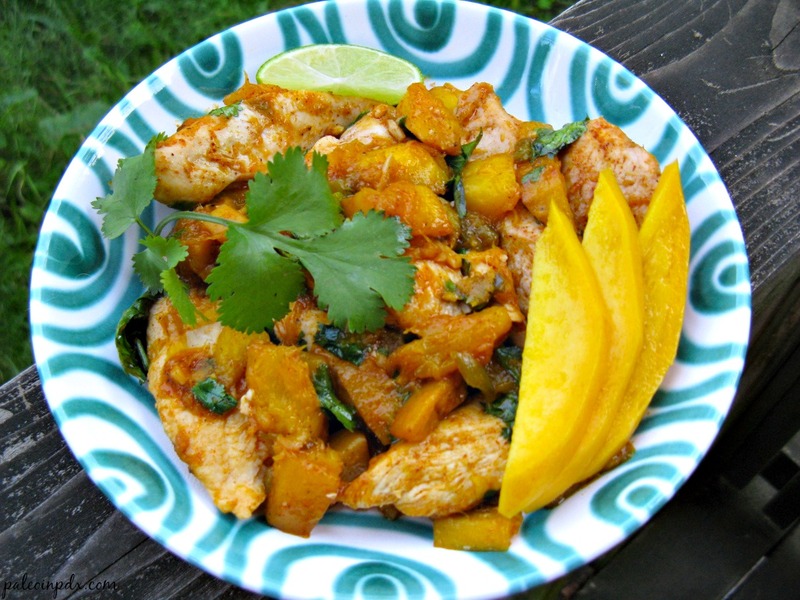 I’ve been a bit inspired by mango lately (remember my mango chicken curry?). Probably because they’ve been on sale so much and seem to catch my eye at the grocery store. 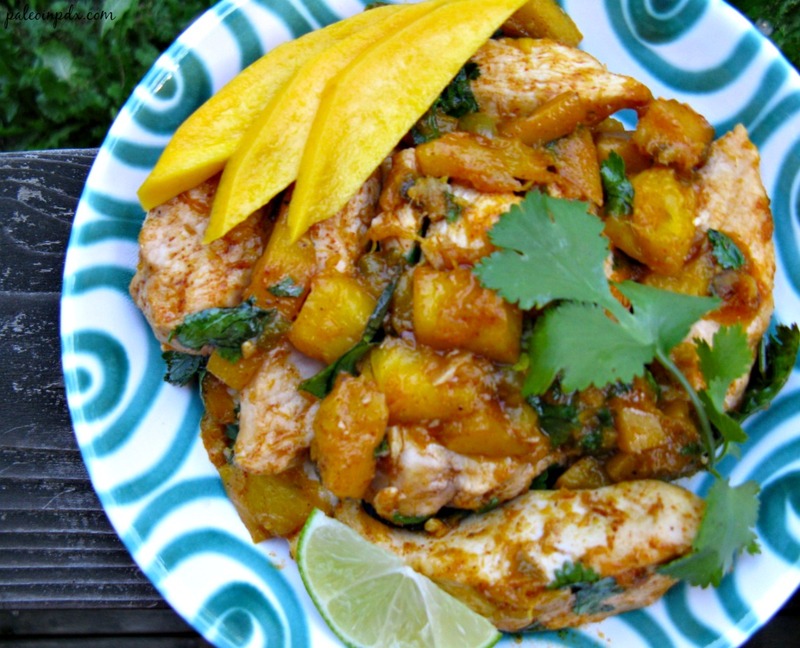 So, it only seemed fitting to make this ginger lime chicken with mango. It’s a delicious, fresh and light summery meal. Also, I love getting the “mango pop” after cutting the majority of the flesh off the pit. Jesse then tells me he wants a mango pop and that it’s not fair. Okay, not really, but if you watch the show Louie C.K., you probably know what I’m talking about. Check out the clip below if you don’t. It’s a goodie. Melt coconut oil in a large skillet over medium heat. Add the ginger, jalapeno and garlic, and saute about 30 seconds. Then, add the chicken tenders and season to taste with sea salt and pepper. Sprinkle the chili powder atop of the chicken and stir. Continue to cook chicken for about 10 minutes, flipping occasionally. Then, add the lime juice and mango. Stir and continue to cook for 5 minutes more or until chicken is cooked through. Once done, remove from heat and stir in the cilantro. Serve with vegetable of choice. We had sauteed kale with halved cherry tomatoes. Even though mangos are not my favorite, I still love your creativity! Thanks! I love mangoes…you really don’t care for them?! Man o’ man, mangoes, beets, banana and bacon. I’m not sure what to think! Ha, awesome! This is one of my favorite recipes and I’m glad you liked it too…and made everyone around you jealous! OMG just tried this and it is DELISH!!!!! I used almond butetr because I had no cashew butetr but this did taste just like pie. I’m new to Paleo, started on 7/10 and already lost a good amout of weigh( 27 lbs), but I am a picky eater and was getting a little tired of scrambled eggs and bacon, so this was a nice change. I LOVE your blog and have told probably ten people let alone in the last week about it. Phenominal recipes, you ROCK!!!! I’m confused…are you referring to a different recipe? I don’t have any recipes that call for cashew butter and there’s no nut butter in this recipe. Anyway, whatever you had, I’m glad you enjoyed it! I appreciate your very kind words about my blog too and appreciate the referrals. That makes me happy 🙂 Stay the course and cheers to you for switching to paleo!